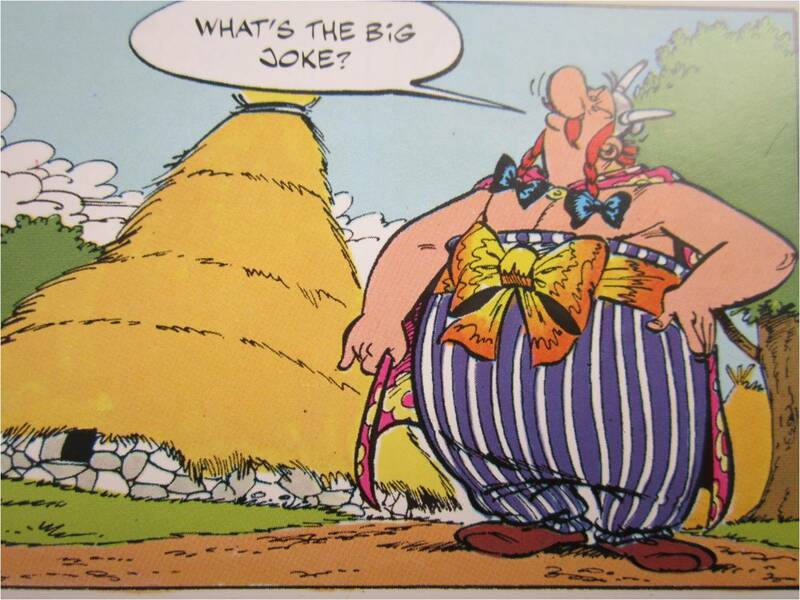 Obelix and Co, the 23rd in the series by Rene Goscinny and Alberto Uderzo, first published in French in 1976, deals with the transformation in the ‘one small village of indomitable Gauls’, caused by the introduction of a market for menhirs– and how it affects the design sense as well as the values in the only part of Gaul not occupied by the Romans in 50 BC. As part of a strategy to conquer the tiny Gaulish village that still holds out against the might of Caesar, his deputy, Caius Preposterous trained in the Latin School of Economics, proposes to use ‘the profit motive’ to enfeeble and corrupt the Gauls. 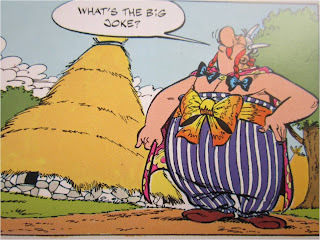 He homes in on Obelix, ‘the big fat brute’ who is the terror of the Romans, convinces him that ‘having money is a good thing’ and buys the only thing he can from him–menhirs–in great numbers and for increasingly large sums of money. To cope with this sudden demand for menhirs, Obelix sets up a company, employs fellow-villagers to turn menhirs, to stitch clothes for him, and even to hunt boars! This sets of a flurry of menhir-turning amongst practically everyone in the village, regardless of aptitude or training. So, Fulliautomatix abandons iron-smithy and Unhygenix stops selling fish, because the only market is for menhirs and boars. Tempted by the lure of money, the villagers lose their ability to think rationally and the leisure to do things properly – even to have fun. As Chief Vitalstatisx remarks to Asterix and the Druid Getafix, the only two to remain unaffected by the new economy, they are ‘the last sane people in the village’. The Gauls no longer have either the time or energy, or even an interest in beating up the Romans, who are after all business partners. In the bid to sell more and more menhirs to the Roman camp, they forget what is sensible and logical in their habitual way of life and lose all sense of balance and proportion. And Caius Preposterous’s strategy is successful. Meanwhile, the mounds of menhirs are rendered unto Caesar, who is not unnaturally, unhappy at the drain on his treasury for something that is ‘no good for anything’. So, Caius conceives of the strategy to sell them to the Roman public. Since they are not ostensibly useful, comfortable or fun, he decides to milk the envy factor – “You own a villa, a chariot, slaves but…do you own a menhir?’. The menhirs are marketed in Rome with an all-out publicity campaign that endows them with values of ‘status’ and ‘exoticness’. The Roman public falls for the marketing strategy and laps up the menhirs that have neither any functional or cultural value in their context (which presumably, the menhirs do have for the Gauls – even though they do not quite know how). Everyone cashes in, with rival sellers promoting Roman vs. Gaulish menhirs. The artificially created symbolic value of the menhir plumbs absurd depths with superficial twists in appearance, and advertisements claiming the merits of Egyptian menhirs, or offering free slaves for every menhir! Finally, the market crashes, the Gauls are told that their menhirs are no longer required, and after trading insults and fighting with each other, good sense finally prevails. They go back to beating up the Romans and end with a grand feast to celebrate the restoration of their own ‘indigenous’ ways. And how does their brief foray into ‘the market economy’ affect design? In various ways. Since they lose all sense of proportion in aspects of daily living, they are inevitably unable to apply a sense of proportion and balance in any design decisions, with respect to the attributes of the product as well as what sort of product they should be making. The only gauge of the necessity of making a product is whether there is a market for it, and how much money does it get them. So, the overriding preoccupation is with numbers - “How many menhirs can you deliver?” This obsession with quantity, rather than quality, nor even with necessity, is akin to the influences in the industrialized large-scale markets of today, where the only emphasis is on ‘more’. Design offices today, are rated on their size, not on their ability - how many people do you employ in your office? Loans are given by governments or by investors based on ‘how much can you produce’? Contracts are given on the basis of ‘what is your annual turnover?’ Rarely are there any discussions about creativity, congeniality or craft. Not only does this flood the market with superfluous non-essential designed items, it also creates a situation where standards of design are lowered all across the spectrum - in the producers’ world as well as the consumers’ world – to demonstrate notions of economic superiority. So Obelix dresses up in ridiculously ill-suited clothes to show that he is ‘the most influential man in the village’. Soon practically the entire village follows suit and dresses in loud clothes and absurdly ornamented accessories. This is similar to what is happening and has already happened in the Indian context, where the qualities of balance, proportion and appropriateness in design are giving way to kitsch. So an economy of money seems to lead to a dumbing down of design ethics and values. Along with a devaluation of and deviation in design sense, this introduces standardization and reduces diversity. For a global market, everything has to confirm to a uniform standard. The only relief is in superficial changes. Thus, there is no great difference in mixer or refrigerator specifications, or automobile engineering. Instead, product designers are hired to introduce ‘styling’, cosmetic changes, features in the ‘dashboard’; colours of finishes. While all the emphasis is on profits, a lot of money is invested in publicity campaigns. This explains why innovative designs such as the ‘Mitticool’ refrigerator arise not out of the minds and hands of trained product designers, but a potter from a local context who designed this to fulfil the need of his fellow-Gujaratis after the earthquake. The depths that public gullibility can plunge to - and the frenzied commercial activity that this can lead to – are clearly evident from a reading of A Short History of Financial Euphoria, J.K. Galbraith’s excellent analysis of speculative economic debacles down the ages. In particular, the classic case of Tulipomania in Holland in the mid-1630s, where ‘people of all grades converted their property into cash and invested it into flowers’ - namely in the tulip, which first came to Europe from the Mediterranean in the 16th century - shows that such hysteria not confined to the realm of fiction. Very well written, Anisha. I keenly read your writings. While reading this, I am reminded of a statement by Joseph Stiglitz in a lecture at JNU recently. He said that corporations and banks saw a lot of money at the bottom of pyramid and they thought why it was there and it should move up. This is what guided their economics. Interesting! Well put. Quantity not quality can be the motto of the nation. However, maybe you can send a copy to the Americans and suggest that they could use the strategy - buying menhirs from the Taliban - to break the Afghan gridlock. I am, thankfully, not an economist, and still have vestiges of my soul, but it would appear that this is a an accurate encapsulation of the 'values' of the capitalist system. An accident by design. Dare we call it a parody? Can one parody a farce? I know not, madam. Hotaa kuchh agar hosh to maikhaane na jaate. and, as such, can no longer afford to patronize her bar. Heidi keeps track of the drinks consumed on a ledger (thereby granting the customers loans). gets no resistance when, at regular intervals, she substantially increases her prices for wine and beer, the most consumed beverages. A young and dynamic vice-president at the local bank recognizes that these customer debts constitute valuable future assets and increases Heidi's borrowing limit. He sees no reason for any undue concern because he has the debts of the unemployed alcoholics as collateral! Naive investors don't really understand that the securities being sold to them as "AAA Secured Bonds" really are debts of unemployed alcoholics. Nevertheless, the bond prices continuously climb - and the securities soon become the hottest-selling items for some of the nation's leading brokerage houses. One day, even though the bond prices still are climbing, a risk manager at the original local bank decides that the time has come to demand payment on the debts incurred by the drinkers at Heidi's bar. Heidi then demands payment from her alcoholic patrons. But, being unemployed alcoholics -- they cannot pay back their drinking debts. Since Heidi cannot fulfill her loan obligations she is forced into bankruptcy. The bar closes and Heidi's 11 employees lose their jobs. Overnight, DRINKBOND prices drop by 90%. The collapsed bond asset value destroys the bank's liquidity and prevents it from issuing new loans, thus freezing credit and economic activity in the community. The suppliers of Heidi's bar had granted her generous payment extensions and had invested their firms' pension funds in the BOND securities. The funds required for this bailout are obtained by new taxes levied on employed, middle-class, nondrinkers who have never been in Heidi's bar. Anisha you're simply confusing 'monetary gains' with 'profit motive'. There's definitely more to the profit motive than just that, a product of which is this Facebook medium that we are using right now.